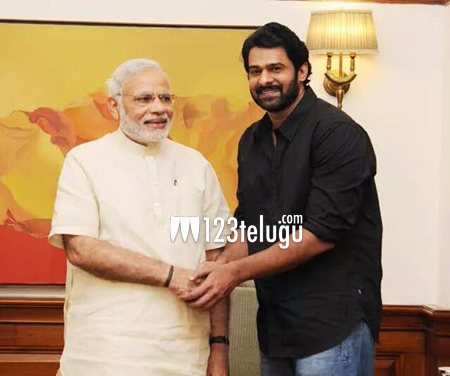 Yesterday, Young Rebel Star Prabhas, along with his uncle and BJP leader Krishnam Raju, met the Indian Prime Minister Narendra Modi at his residence in 7, Race Course Road, New Delhi. Prabhas requested the Prime Minister to watch Baahubali and the PM told him that he will surely watch it later as he is busy these days. While Prabhas’ fans are thrilled with their favorite star meeting the Indian Prime Minister, they are absolutely thrilled with Modi’s praise to Prabhas. Modi, in his interaction with Prabhas, reportedly told him that he indeed looks like a Baahubali. This made the already jubilant fans even more ecstatic and they are seen sharing their joy on social media. The Prime Minister even tweeted a photograph with Prabhas and said, “Met ‘Bahubali’ Prabhas today.” Apart from Modi, Prabhas also met the union cabinet minister Rajnath Singh and senior BJP leader LK Advani etc. Baahubali, after amassing more than 450 crores at the box-offices worldwide, has now become the country’s third highest grosser, next to Aamir Khan’s PK and Dhoom 3.